Jamaican Corn Meal Porridge – Tired of the same oatmeal for breakfast? 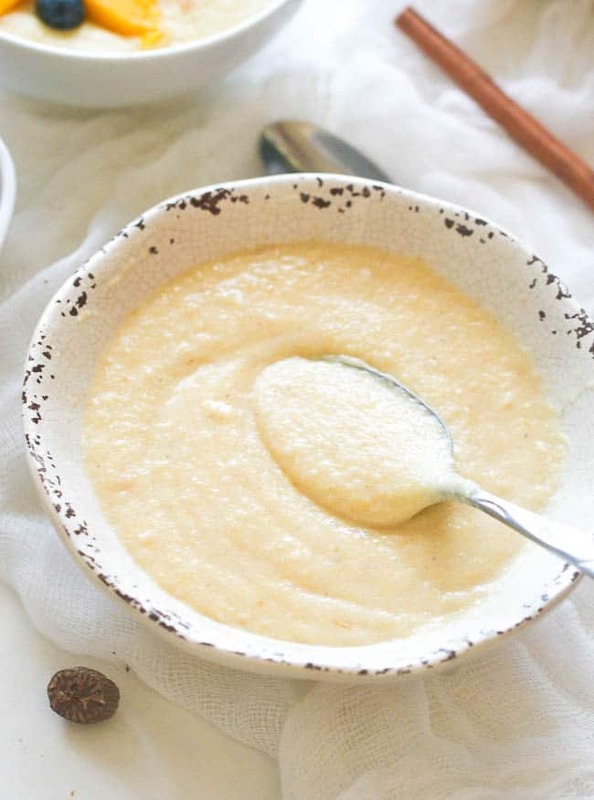 Mix it up and try this warming cornmeal porridge instead! 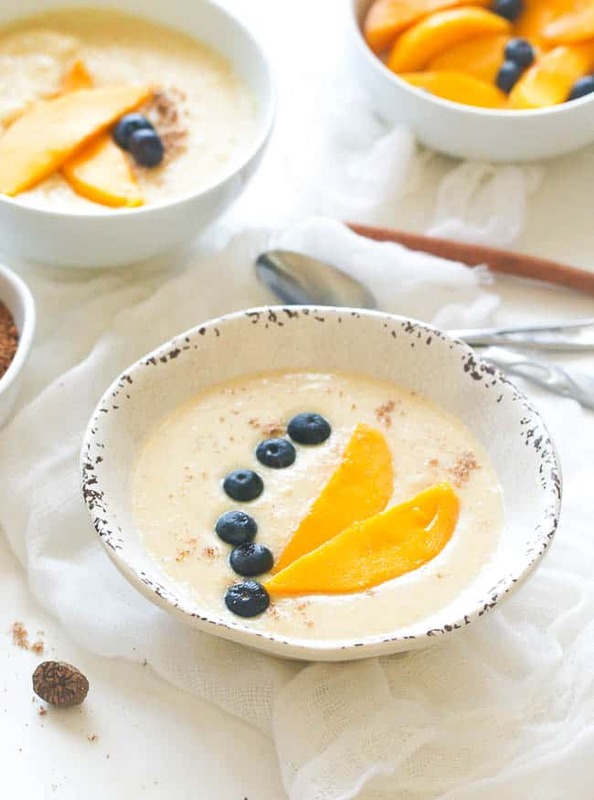 Infused with Caribbean spices and coconut milk for a complete warm and comforting breakfast. Tell me is there a better way to kick start the day than with a warm, hearty breakfast. If you wake up wanting something a bit sweet to combat early morning cravings then you are in luck. 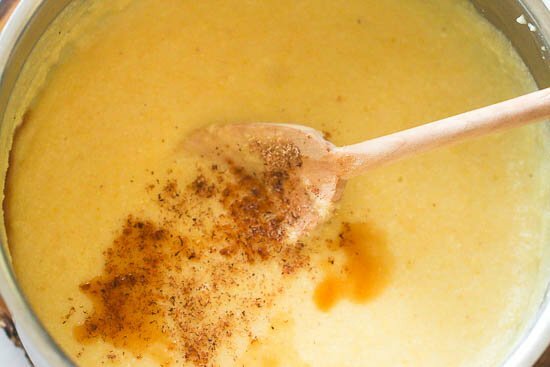 This Jamaican cornmeal porridge will do just that. What I like about it is that it’s so filling and very energizing making it ideal for a pick me up in the a.m. breakfast. We have been blessed with some much-needed rain here in Southern California. 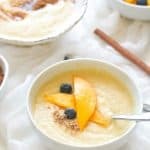 When it rains all I want to do is cozy up with a bowl of this cornmeal porridge and watch as the rainfall in crazy chaotic drops- slowly savoring one spoon at a time. Secretly wanting it to go on for days on end. But every good thing must come to an end. 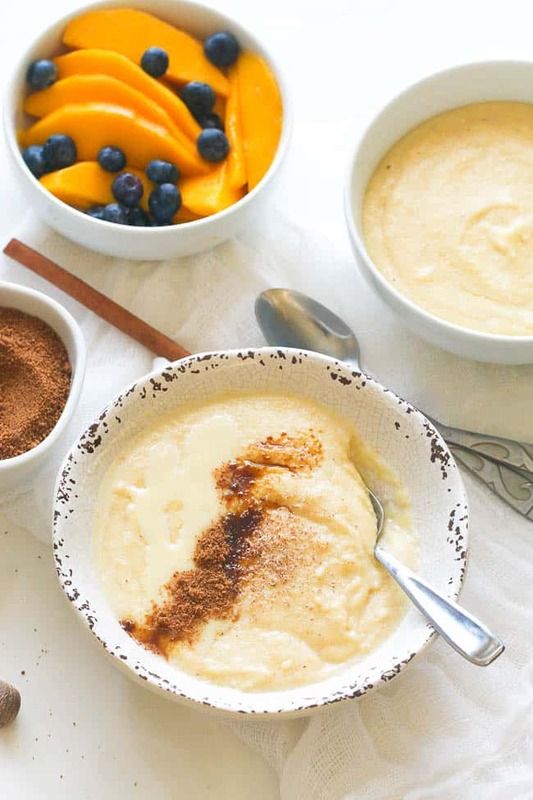 This Traditional Jamaican cornmeal porridge, is also known as “Cog” and “Pop”- a Caribbean breakfast dish that dates back more than a century. What does it taste like? 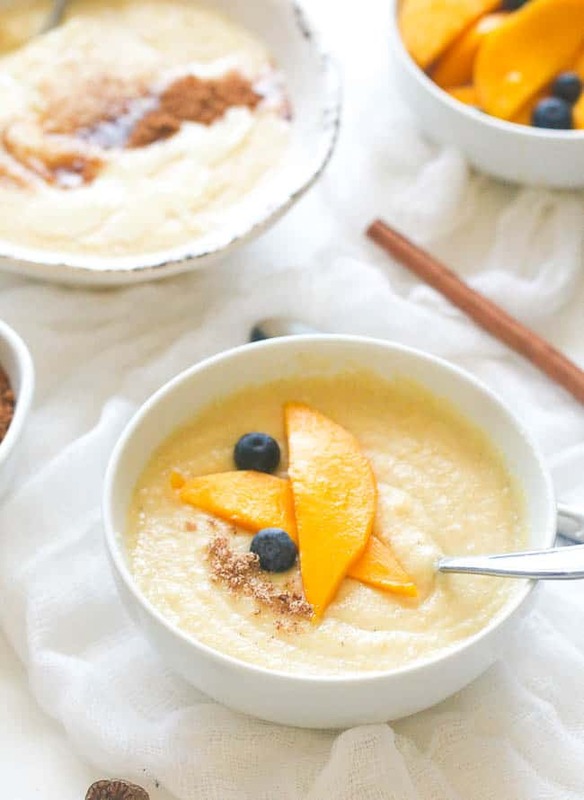 An incredible cross between traditional porridge and grits. You have sweetness along with warmth from the cinnamon , nutmeg as well as the sweet “corny” flavor of the cornmeal itself. A hot cereal with depth and texture that is not too heavy on the stomach. Taste great on it’s own but when combined with fruits and nuts it’s heavenly. My favorite is mango and blueberries. You can’t go wrong with sliced banana, mango, slivered almonds and/or walnuts. Lastly, you can serve this for brunch, lunch, dinner or an indulgent snack. 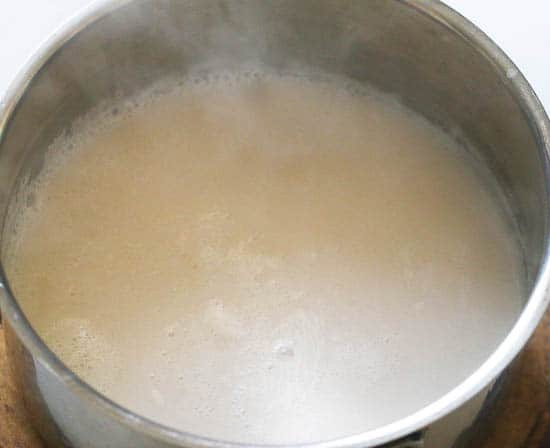 Be sure to stir the porridge frequently during cooking to avoid any lumps in your porridge. Adjust flavorings and milk to taste. However, nutmeg and vanilla are essential in making Jamaican Porridge. Add about 2 cups water and 2 cups coconut milk to a heavy large saucepan. Throw in ½ stick cinnamon stick. Bring to a boil. 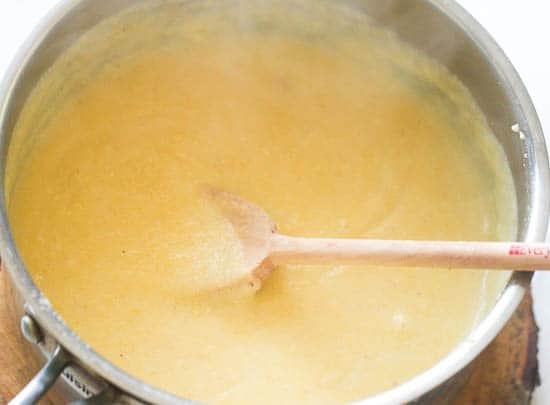 Gradually whisk in the cornmeal, until you have add the whole thing in the pot, a little bit at a time and keep stirring with a wooden spoon to prevent any lumps. Reduce the heat to low and cook until the mixture thickens about 15 minutes. Add flavoring vanilla extract, nutmeg and sweetened condensed milk. Adjust consistency with coconut and/or water if desired. Jamaican Corn Meal Porridge- Infused with Caribbean spices and coconut milk for a complete warm and comforting breakfast. My son fell in love with cornmeal porridge in Jamaica this winter. He says this was almost as good. I think the warm ocean breeze and view might have been the missing ingredients. LoL. I need to add these two ingredients to the mix to make it just right. Thanks for taking time out to share this with us Mary. I married a man from Jamaica and I’m American… I make this recipe for him and it makes him behave well. Very good recipe. I like it too and our kids too. Wonderful recipe. I can’t wait to try it. What’s the difference between drinkable coconut milk and the coconut milk in the can? Or is it the same? I love cornmeal porridge, but I have high cholesterol, I just noticed how much saturated fats it contains..
Any tips on how I can make it with less saturated fats.. I guess I can probably use soya milk instead of normal milk, but what about the condensed milk..? What could I use instead.. It’s just not the same without it..
How long can I keep corn meal porridge in the fridge for? I usually don’t let it stay for more than a day. Mine never lasts anyways. It’s best the day of. I just discovered your blog, so many delicious-looking recipes! I love Caribbean food, even if I’ve never tried to cook it myself before. 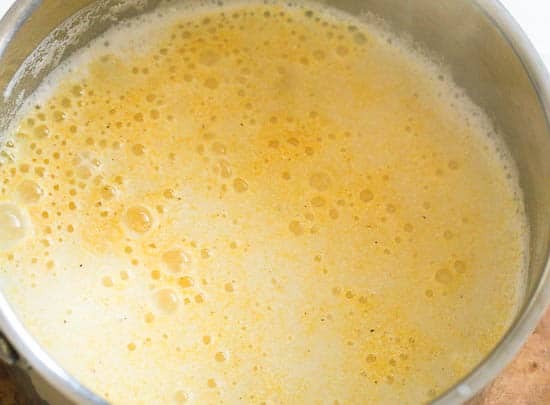 This corn meal porridge looks sweet and comforting! Definitely the kind of food I’m craving at the moment, as it’s freezing cold here in France… I can’t wait to try this recipe, thanks for sharing! Hi Claire! It’s definitely the time to make this, I can only imagine how cold it is there. Happy Cooking!!! i love your recipe! thank you for sharing!!! Thanks for letting let me know ! Very good. I used light, canned coconut milk and boiled milk and sugar for the condensed milk while my porridge cooked, then added it right before serving. It wasn’t as thick as canned sweetened condensed milk but I liked how it thinned out the porridge a little. Thanks for the recipe! Awesome! Thanks for taking time out to share your thoughts with us Nikki. God Bless! You bet! I Bought Goya- Pre-cooked cornmeal! Yo will be like Oh YEAH!! The coconut milk takes it to another level. I love everything coconut!!! I love cornmeal porridge too but never cooked this version but I’m sure I ate it. This is my fourth time cooking it. Never thought of that! Will certainly be trying it out pretty soon. Thanks ! It took me a long time to finally get it right, thanks to your simply, quick & easy recipe this brought back memoires of my childhood. It came out perfect w/no lumps. I can’t wait for my son to taste it. He’ll never want to buy that Grace instant Porridge anymore. Thank you so much Imma! You are welcome Karen! So glad I could have been of help . Thanks for taking the time to share your thoughts with me. As a bachelor with no wife or kids, I sometimes miss the food of my childhood. Mom would make this and so I tried it. My google search led me to your directions and let me say, it turned out wonderful! I kept stirring, and adding vainlla and nutmeg and cinnomon until it tasted like moms. The butter was the thing to add a bit os silkiness to the whole thing. Plus it was easy to make. Hopefully I’ll be able to make it for someone I love someday. I just came across your site and love your recipe for cornmeal porridge. Oh, how it brings back memories of schooldays when Mom would have that steaming bowl of porridge, made with coconut milk, just waiting for us after school. Will definitely try this. Thanks so much. My pleasure! Thanks for taking the time to share your thoughts with us. Hi! I am making porridge for the first time this morning, and unlike many others, I actually prefer my porridge lumpy! Do you have any suggestions for making it this way, yet still tasting great? Thank you beforehand! Only stir to prevent burns. That usually creates lumps. And also use a cooking spoon instead of a whisk. Hi Ethan! The kids are going to love it . Mine always do. Happy Cooking . Thanks so much for tbis recipe. That’s an awesome tip! Thanks for taking the time to share this with us cham! When sroring it in the fridge try blending it then reheat to get the lumps out. Awesome! Thanks for sharing this tip with us Nicky. I love cog (or pop) in the morning. 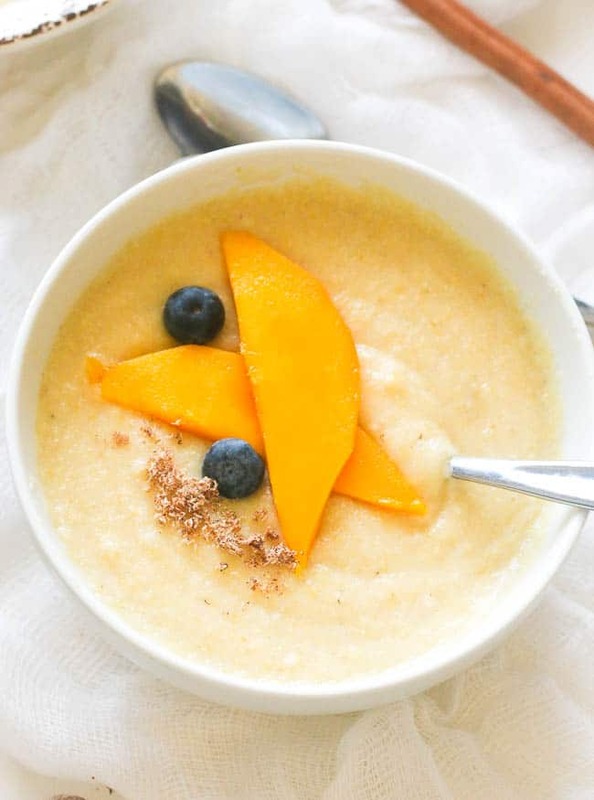 The earthy cornmeal and coconut is a great way to start the day. Your version is very close to my auntie’s. Do you have a slow cooker version since I get up early and my wife sleeps later? I am a huge fan of Cornmeal Porridge, sadly I have not attempted to make it yet. I have a quick question though, after making the porridge, how long can I store it in the fridge for? And if so, how would I re-warm it? Would I put it back on the stove? I am asking for my mom, as when she has my great nephew over night, he seems to be hungry, and growing up with a lot of Caribbean friends, I remember their mom feeding their babies cornmeal porridge before bedtime to fill their belly up for the entire night. Hence the question about storing it. Hi Chrissy! I think cornmeal porridge is best when cooked the same day. It really doesn’t reheat well. Some of my family members make a day ahead and reheat in the microwave. Just feel is not quite the same- texture wise. Ms. Imma, I have to try this! My mom makes the best tasting porridge and she hasn’t taught me her secrets really. Porridge and corn meal at that, is one of my favorite things to eat growing up as well. When I make it, its ok but I need and just have to try this recipe. I will make the coconut milk myself though as it will be more organic and without preservatives of any kind. I will try this and let you know how it turns out. Thank you sooo much for this recipe. Awesome! I think fresh coconut milk will make it taste even better. Hope this works out for you. Can I use almond milk instead of coconut milk? I was very yummy impressed with much gratitude and blessings! You’re in good company. Yes to the additions, I tried it recently with almond butter- and loved it! You can really kick it up a notch with various toppings! Glad to hear you enjoyed the escovitch. I was going to make some this morning and I asked my husband to run to the store and grab some corn meal. He came back with corn meal mix. Can I still use that? Hi Evani! It will taste slightly off. It’s best made with cornmeal only- corn meal mix has flour in it. You might want to try it and see how it turns out. Looks super nice and it’s naturally gluten-free which is great for my coeliac friend. I will try it one day! Awesome! I love porridge it’s so comforting . Ok so finally I’m in the right season for this…do you think coarsely ground cornmeal will still work? I have got a bag of polenta bramata flour that is due in a short time but I don’t want to make polenta. Should I cook it for longer? Sorry for bothering you. You certainly can and yes cook it longer. Didi! I love having you here- Seriously.You are NEVER bothering me. Always look forward to your comments. and/or insights- Appreciate you girl!!!! Ok thank you, I think I’ll try it in the next 10 days or so, with the summer heat arriving and all I’ll be using your recipes more these days! Sadly I don’t know if I will be able to get coconut milk so I will likely use cow’s milk. I do not drink porridge of any kind (an overdose as a child) 🙂 but I make cornmeal porridge once a week for my 5yo. I sometimes add a bit of orange peel to give it the old timey feeling and a nice flavour. My son loves it and says mommy makes the best porridge. Thankfully he is too excited to notice that I do not have any. I will definitely try the butter the next time I make it. It’s even better with butter.YUM! can you use canned coconut milk vs the carton drinkable variety? is that the kind that’s in the refrigerated section like regular milk? Of course you can. You just have to dilute it -because it contains a lot of fat. However, adjust to suit your tastebuds. Yes it’s in the refrigerated section like milk. And you can also find some next to almond milk. If you got the reduced fat version of canned coconut milk would that work, rather than diluting the full fat version? Been looking for some different breakfasts to try so excited to try this! Do you think you could cook it overnight in a slow cooker? Wondering if you make it up to the slow cooking stage if you could then put it in the slow cooker or in the over to bake through? Mornings are a little busy in our house! You could but I wouldn’t be able to tell you the exact water measurements. You might have to experiment with the liquid proportions. I have yet to try in a slow cooker. Think of this process like the risotto process. See it’s one of those things you constantly stir and if you leave it can become lumpy and unevenly cooked—- plus the clean up is horrendous in the slow cooker. Never take your eyes off of it. (I add a little sesame oil and use coconut, cashew and almond milk in place of all the dairy milks, I also use agave nectar and honey to sweeten with a pinch of Himalayan salt). Butter is something I’d like to move away from (health reasons) but nothing is more delicious than when you bring this dish home with salted and sweetened creamed butter. Okay now I’m off to make some. Couldn’t have said it any better. Thanks Mina. This brings back many memories, time and place from childhood days. Growing up my auntie often used to make this for us as well we used to have it often before bedtime. Often we had it plain but sometimes with bananas as they were ever plentiful. I often luv the nutmeg taste in it and just not the same without it. Food like this always bring back long almost lost memories buried in the cobweb of the mind, but how easy do you find them just looking at and remembering a simple dish. I hear you Urban. The best tasting dish are the ones that invoke childhood memories… I have plenty of mine. It’s awesome to see a cornmeal porridge recipe here. I am originally from the Caribbean and there are all different versions of this dish. I have a Jamaican friend who make the best cornmeal porridge and the secret is to add a pinch of salt and a knob of butter to the mix. Takes that porridge to different levels of delicious. Loving your site and all the recipes. Makes me think of home. Oooh butter would definitely kick it up a notch. Thanks for taking the time to share this with us.